Over the years I have seen many a Van de Graaff generator drawing and if there’s one feeling that sums it up for you when you see one, it’s that Van de Graaff generator is an absolutely doable as a DIY project, despite all the high voltages and physics at play. Mechanically it is a very simple device and all parts of it are readily available. All parts that is, except for the top “high potential spherical terminal” a.k.a. 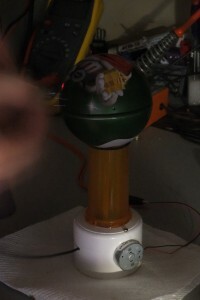 the metal sphere which stores the charge. Even though the metal sphere is not a stuff of high science, you really have to look hard to find one. I have seen half spheres sold in places like Ikea, mislabeled as salad bowls, but never really a complete sphere. Fast forward to pre-Christmas 2012 shopping craze. Perhaps they did it before and I missed it, but this year Mars, Inc. came up with a real treat for science enthusiasts everywhere (or at least where M&M’S candies are sold). 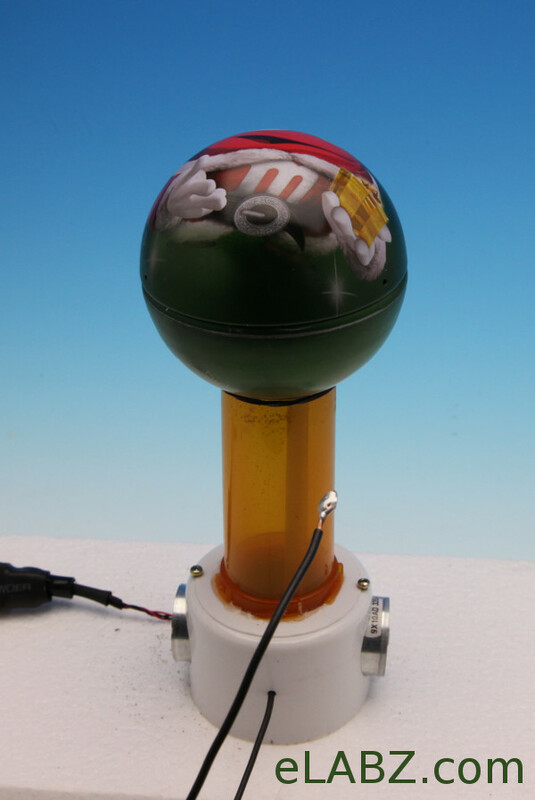 They came up with an M&M’S Christmas ornament candy tin which is an almost perfect metal sphere 70mm in diameter. The tin is sold for $2 in the grocery store I got to, hence the title of this post. It is not unreasonable to expect it to be $1 by the time the holiday shopping season is over and I have actually already seen 99 cent candy tin spheres exactly like M&M’S but with different candies in a CVS pharmacy store. Did I mention that as an extra treat they also have candies inside? Once I had the sphere, all other parts simply fell into their places in my mind. I should warn my readers that I never actually throw away anything that can be used to build anything (which includes almost everything non-perishable ) and therefore my stock of “found parts” is rather large. Depending on the size of your “found parts” stock you may have to buy a part or two but you’re probably still going to stay within the couple bucks budget. 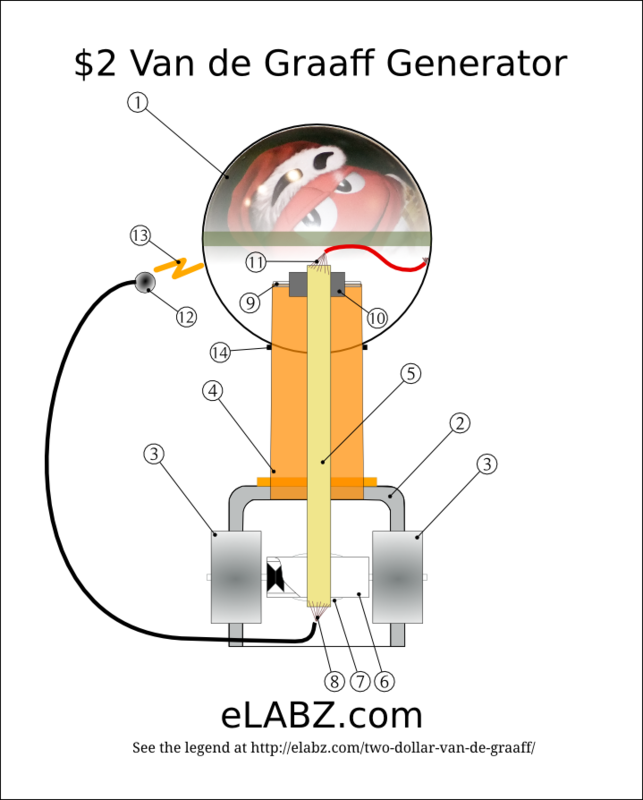 Take a look at the diagram and the parts list below, chances are you already have everything you need to start building a Van de Graaff! Lower motor housing – 2″ PVC plumbing pipe end cap fitting. Mine came literally from trash left over from the builders of my house. If you have to buy one anew, it will set you back $1.38 at HD or Lowes. 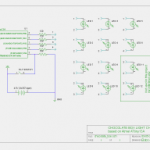 Quantity 2 – Low voltage brushed DC electrical motors. Mine came from two disassembled desktop DVD-RW drives. The motors are what makes the disk tray to open and close. I have to explain the “quantity 2″ part – it would have been enough to have only one motor in the generator although it would work a little hot. I have tried one motor but had to install the opposing second motor only because the motor has nice bronze bearings – the part I could not quickly find in my “found parts” bins. Since the rubber band is stretched, it bears rather hard on the bearings of the lower pulley, and I felt that I would much rather use two motors with good bearings that balance the load than to have one motor’s bearings overloaded and fail very soon. I got the motors for free and I have a small boatload of them, so it was an easy decision. If you’re limited in DC motors, you’ll just have to find a way to properly support the other end of the lower pulley. The electron-moving belt – the 3.5″ long rubber band. I think Staples calls them #64 . I never really have to buy them – our mailman wraps large batches of (mostly junk) mail in a rubber band like this. Since my mail is mostly batches of junk mail, the mailman has become an endless supply of rubber bands for this household. Lower pulley – this one is funny: it’s a plastic core (I believe ABS) of dog poop collection bags roll. I don’t throw those away either. Mostly because they are the exact length and diameter of a AAA battery. It gives them a special significance in my mind :). I have two dogs and they are both almost 8 years old, so you can see I’m overflowing with these plastic cylinders. It would be a crime not to start using those in projects ASAP. Their internal diameter was perfect for press-fitting them (lightly) onto the original small pulleys of the DVD-RW DC motors and I felt completely vindicated for all those 8 years of collecting these! A bulge of Teflon plumbing tape wrapped around the lower pulley makes the lower pulley negatively charged (Teflon is a potent negative on the triboelectric scale ) and, extremely, importantly, it prevents the rubber band from sliding right off the pulley. I have to admit I’ve yet to wrap my head around how the bulged (crowned) pulleys manage to keep belts on track (found a web page about it here, need to read it carefully later) but it was rather quite illuminating to see how even a crude “crown” made of a few (less than 10) wraps of plumbing tape made the rubber band stay on the pulley whereas without it, it would slip right off! 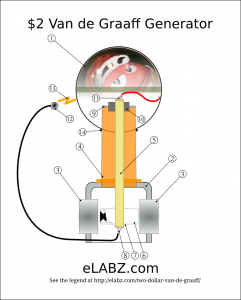 The upper pulley axle – made of a 3mm polished metal rod that the DVD-RW laser diode sled slides on. 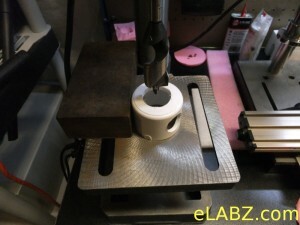 Cut to size with Dremel ferrous metal cutoff disk. A small ball of solder at the end of the lower charge collector brush wire. I’d say it’s optional but it does make it look like a full size Van de Graaff’s discharge wand. Here are some more pictures of the $2 Van de Graaff generator building process. Picture to the left shows most of the parts that I started out with. Eventually a second DC motor was added (see a comment about two motors above) and the switch was removed when have found that too much wiring inside the body of the generator (a.k.a. 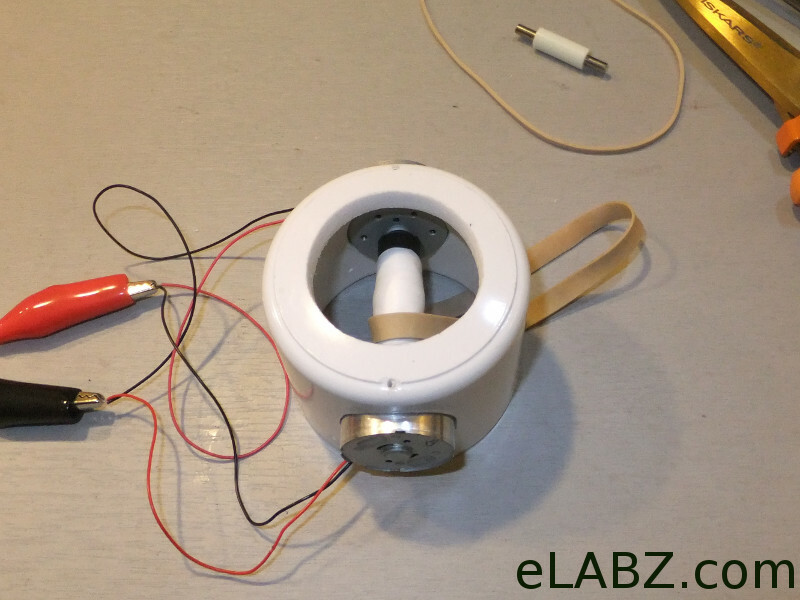 2″ PVC pipe cap) makes the charge escape too easily via those wires. In the final version of the generator all of the wiring is done on the outside of the pipe cap and the switch is at the power socket. The 3mm polished metal shaft that the upper pulley is turning on and the dog poop bags core (a.k.a. the lower pulley) were cut to size. 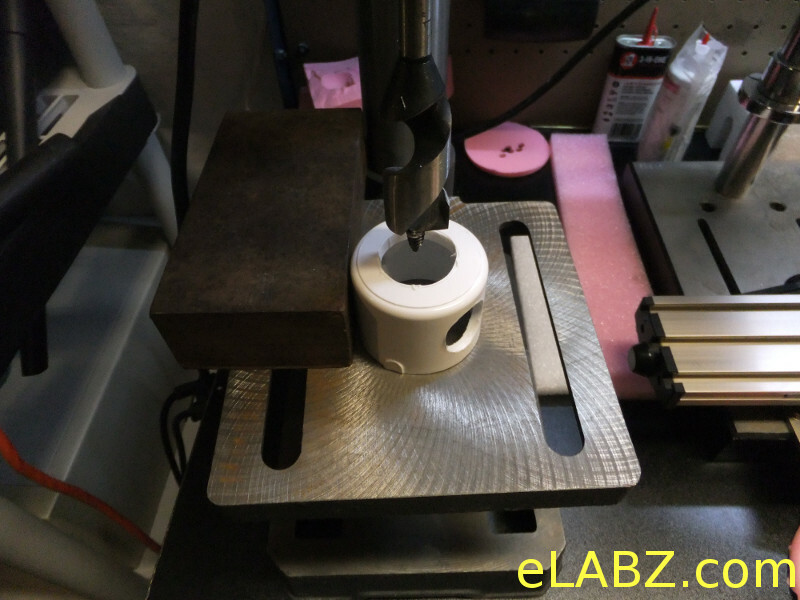 I have drilled the three large holes in the 2″ PVC pipe cap using a 1″ wood drill bit mounted on a drill press which has been set on the lowest RPM setting possible. I’m not sure what the actual setting was but it was rather slow, perhaps 600 RPM or less. PVC tends to give way to the drill bit and creates a lot of friction which in turn tends to soften or even melt the PVC itself, so doing all the drilling on small RPM is important. Additionally: please note that the picture does not show any clamps that I used to hold the cap in place while it was drilled. Because of the high friction between the PVC part and the drill bit, you absolutely cannot hold it by hand while drilling (certainly not with a 1″ drill bit) – it would be dangerous to drill it without having it properly mounted. I did not have proper drill press vise for that so I had to devise a way to affix the cap to the large square chunk of steel you see on the picture with clamps, then clamp the steel block to the drill press. All of that would have been far easier with drill press vise. Note to self: get one soon! The vertical column (a.k.a. the pill bottle container) drills very easily with a 3/4″ step drill bit. 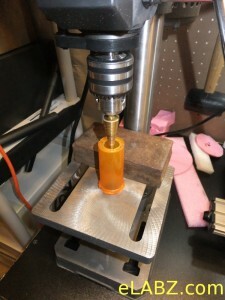 Keep the drill press on the lower RPM setting. 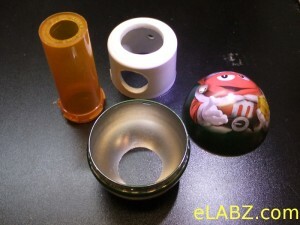 The pill bottle looks to be made from acrylic and would also melt of overheated on high RPMs. The picture on the left was supposed to represent all of the parts that needed to have large holes in them drilled in finished. However, I took it before I realized that I needed a second motor, so the final look of the 2″ PVC pipe cap includes another 1″ hole directly opposite to the one that’s on the picture. The reason I made this picture was because making those holes represents almost 75% of the entire time needed for this project. One of the reasons for me was: I did not have a 1-1/4″ wood drill bit which was needed to make the large hole at the top of the PVC cap to accommodate the pill bottle. I had to use a sharp knife to “extend” the 1″ hole – maximum size I could make on the drill press using the drill bits I had. 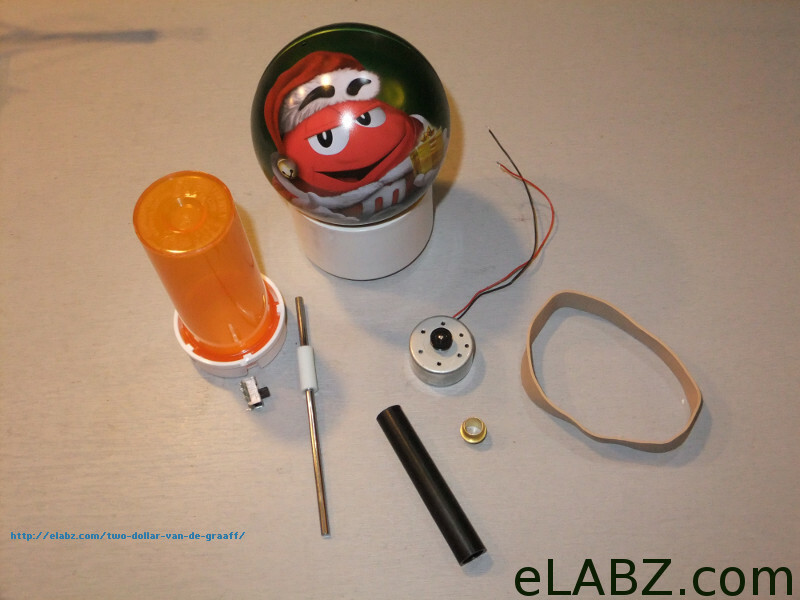 With the 1″ holes for the DC motors I got lucky – the motors themselves are 24mm in diameter. However, when PVC is drilled, it gives way and the hole ends up slightly smaller than the drill bit (1″-25.4mm). This worked great because I could just slide the DC motors into their respective mounting holes. I ended up drilling and threading 4-40 vertical holes along the sides of the PVC cap, above each motor, for set screws. This was just to prevent the DC motors from moving under vibration. A special note about making the hole in the M&M’S candy tin. I measured diameter of the pill bottle at the height where I wanted the sphere to sit at (the pill bottle tapers slightly off towards the bottom, and is standing upside down in this project) and scribed it with a caliper right on the paint of the bottom part of the sphere. The exact right diameter happened to be 31mm. Then I drilled a 1/2″ hole with a step drill bit in the center and used a nibbler tool to extend the hole to almost the required 31 mm diameter. Since nibble leaves zigzag edges, I used a Dremel sand stone tool (use red, the metal of the tin eats green sand stone alive!) to straighten and finish the hole to size. This next picture shows the base with motors installed (but not yet secured with set screws, holes for which are above motors) and the lower pulley is wrapped with teflon tape to make that bulge, the “crowned pulley” which I wrote at length about above. Note how the motors are wired for the test run: since they are facing each other, they are turning in opposite direction. That’s why you see black wire of one connected to the same terminal as the red wire of the other. If your motors are not identical and not prepped with colored wire leads as mine were, you may want to test the polarity and direction of rotation before you wire them up and run – having two mechanically tied DC motors trying to rotate in opposite directions sounds like a sure way to burn at least one of them. 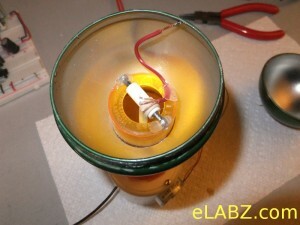 This next picture shows gluing of the vertical column to the base using 5min quick-set epoxy. Note how wonderfully useful the rubber bands were throughout the whole project! These are the same bands like the one that moves electron in the finished generator. 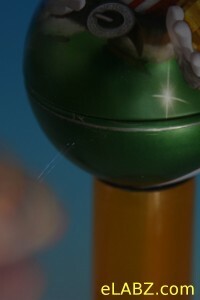 The metal rod at the top of the pill bottle is the remaining length of the 3mm polished steel rod used for the top pulley axle. 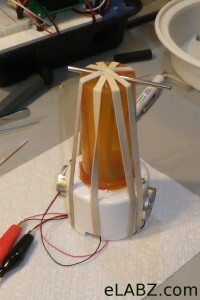 On this photo it sits in the two V-grooves I cut with side cutters in the protruding sides of the pill bottle. 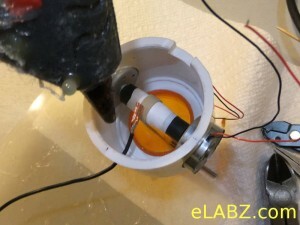 Here the lower brush is fished through a 5/64″ hole in the PVC pipe cap and is glued in place with hot glue gun. I have since found that it would be better to mount the brush less permanently so you can regulate the pressure with which it touches the belt. Also, the 18 AWG stranded wire I’ve chosen turned out to be too thick for the application. The ideal wire brush in a Van de Graaff generator is supposed to very lightly touch the surface of the belt and would have picked up the charge without actually touching by just being in close proximity. But in the scale of this miniature Van de Graaff generator, the 18AWG wires are simply too bulky and I was not able to control the pressure on the belt to my satisfaction. It resulted in a very high wear of the rubber band – something you would want to avoid given that to replace the rubber band you’d have to remove both motors and the top pulley. So, I would advise toy use thinner wire – a 24 or 26AWG stranded wires used in phone and LAN patch cords seem to be more appropriate for this small generator. Now flip the Van de Graaff right side up again and hot glue the top pulley’s axle in the V-grooves described above so that they cannot move sideways. You would need to use locking tweezers or some other locking tool like that to fish the rubber band through the vertical column and up over the top pulley. Note how the rubber band finds a position of its own (not necessarily in the center) – it corresponds to the center of that teflon tape bulge I’ve described above. Let the motors run for a few seconds before you start mounting the top wire brush to make sure the rubber band has found its stable position. Once the band find its position, mount the top charge collector brush (the fanned out copper strands of a piece of 18AWG stranded wire) directly above it and glue the wire in place with a drop of a hot glue so that it’s just touching the top of the rubber band. 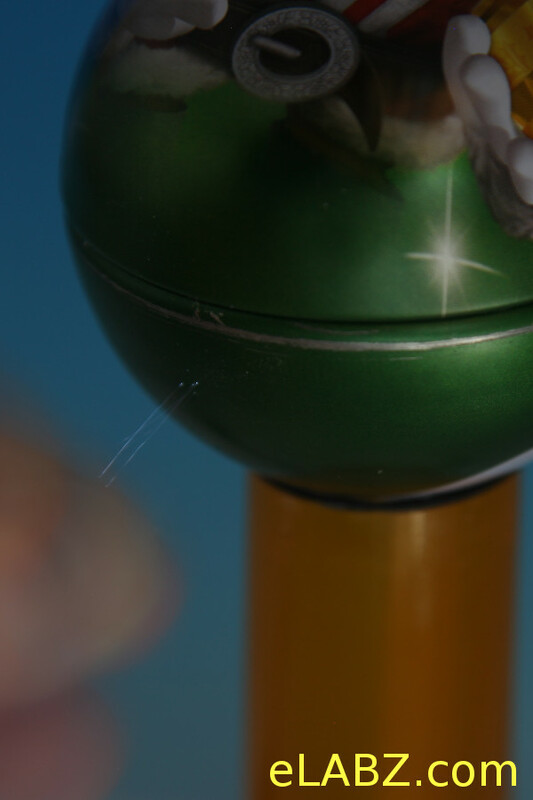 One the glue sets, solder the other end of the wire to the inner surface of the metal sphere. With large amounts of flux and a soldering iron on 360-380C (700F) the tin solders easily, even though “tin” is a euphemism here – there is no actual tin used in this candy container, it’s all just stamped steel. Also visible on this picture is how the rubber band had started to deteriorate already because of the relatively inflexible (compared to the size of the generator) 18AWG wires of the top and the bottom brushes. Once again, use thinner wires if you have a choice. The $2 Van de Graaff generator is complete! Now put the top of the sphere back on and you are ready to make some sparks! I have later added a nice(er) power connector, visible on the first picture at the top of this page as well as a switch, heat-shrink-wrapped together with the power connector. But these are mostly niceties that do not affect operation of the generator much. I am not very satisfied with the performance of the Nylon top pulley against the Teflon of the bottom one, and will experiment with wrapping it in aluminum foil – a better positive on the triboelectric scale. If you are starting anew, perhaps you should use aluminum in the first place. $2 Van de Graaff sparksalot! And, finally, a special note about making pictures of a working Van de Graaff generator, such as the one on the left: it is a beauty to look at but what a pain in the neck to take photographs of! I was totally committed to making the best pictures possible but out of 30 or so I made in about one hour, only two were somewhat passable (you see both here, at the top and at the bottom of the page to the left). Even then these are long exposure pictures where you see a combined result of several sparks (most obvious on this picture to the left), not just one. I could never “catch” one spark even the longest ones. If someone makes this generator and takes good pictures of it working, you will be my hero. Send them to me and I will post them here and your name will live in the annals of the high-speed scientific photography forever. Anyway, what I’m trying to say: it looks much better in real life than on the pictures you see here! Hope you’ll enjoy making sparks with this $2 Van de Graaff generator as much as I did! And thanks for sticking with me till the end of this very long post! Merry Christmas everyone! According to the triboelectric scale, nylon is more positive than aluminum. So, why do you say an aluminum roller would be better? Thanks for stopping by, Daniel. I have seen several of those scales, and on the one I was looking at while building it, nylon was closer to zero than aluminum. Now that you’ve mentioned it, I’ve looked at what other scales are out there on the Net and you are right, the one on Wikipedia has nylon more up on positive than aluminum. Interesting … By the way, these scales are not as set in stone as something like atomic weights and greatly depend on the environment in which they’re measured. My guess is that I just have to try and see for myself, just need a proper sized aluminum roller. Cheers! 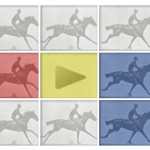 Hmmm… this looks fun! 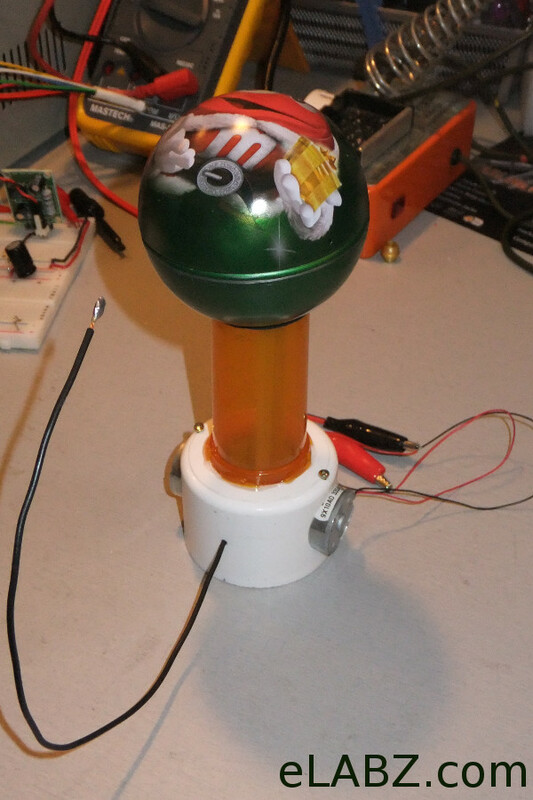 Time to hit the stores in search of M&M’s…for the ball of course!! I am thinking about using an old USB cable to power it… will have to see how that works! Nice little desk toy! I found a bunch of the spheres at Walgreens for .75 cents each, they were smartee’s and Nerds tins. Since I was there to fill a prescription, I asked for an empty tall medicine bottle like the one you used, they gave it to me for free. This weekend my kids and I are going to build it. Thanks for sharing your “thrifty” and simple plan. Clever design. I would like to build one of these with my grandkids. I don’t have any of the type of motors you describe. Can you tell me roughly how many RPM they rotate so that I can find a suitable substitute? If I were to guess, I’d say they put out between 300 and 600 RPM @7V, which is what I run them at – these are not by any means high speed DC motors. Also, the generator starts to produce less static charge when the belt is moving too quickly, so any toy DC motor should do. I got mine from out of DVD-RW drives I’ve tore down. These motors are what makes the CD tray to slide out and back in. I would love to see a picture of your Van de Graaff when you’re finished! Send me some pictures or upload to the forums when you have a minute please: http://elabz.com/forums/post-your-projects/ See if you can take a good picture of the spark – something I was never quite able to accomplish. The reason the rubber band deteriorates so rapidly is not just stress: the amount of ozone generated in the arcs is extremely harmful to rubber. It might be possible to find some synthetic rubber that would hold up better. Great project. Hope your kids apppreciate you. I think you are exactly right, there’s a distinct ozone smell outside of the Van de Graaff when it’s on and I can only imagine the concentration inside is so much higher. Two months since I built it and about one hour of total use and the rubber band seems so frail now, it seems it can break any minute. I don’t know if there’s any polymer out there, especially an elastic one needed for the belt that can actually withstand ozone for long, and I would imagine all other plastic parts are at risk, too, it will just take much longer if the part is thicker.